TV show dates: August 10, 2017 — present. Performers include: Keir Gilchrist, Jennifer Jason Leigh, Michael Rapaport, Brigette Lundy-Paine, Amy Okuda, Nik Dodani, Jenna Boyd, Christina Offley, Wendy Braun, Gino Montesino, and Rachel Ashley Redleaf. A coming of age comedy from Robia Rashid, the Atypical TV series centers on Sam (Gilchrist), an 18 year old on the autism spectrum. Sam is looking for love and a new level of autonomy. While he embarks on his new journey, with the help of his therapist Julia (Okuda), Sam’s mother Elsa (Leigh), father Doug (Rapaport), and sister Casey (Lundy-Paine) have to learn to come to terms with what his quest for romance and independence means for them. The story also explores what being “normal” truly means. What do you think? 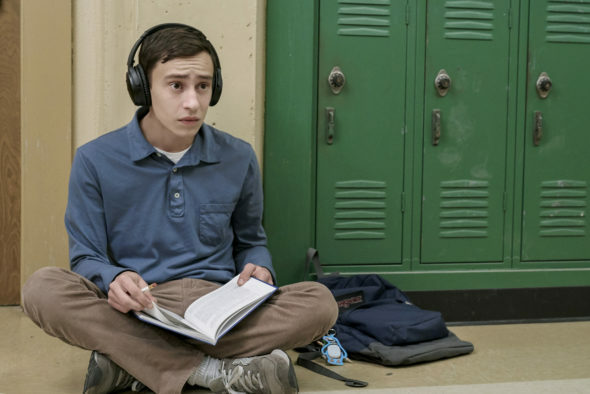 Do you like the Atypical TV series? Should this TV show be cancelled or renewed for another season on Netflix? Great Show! Please continue it. My entire family loves this show, as does my son’s family and my daughter’s family. So glad to see it continue. I would love to see this show continued. My grandson has autism he is eight and I know he will go threw some if not all the situation and issues. It helps parents see things that will arise in the spectrum world. I think the show is great. I have two grandchildren with Autism and they are great kids. I think the world should see that kids with Autism are first of all kids who have to face the same issues other kids face, only with a lot more obstacles. The show is inspiring.